Marc Lamont Hill Premieres as New Host of "Our World with Black Enterprise"
NEW YORK, NY--(Marketwire - October 7, 2010) - Dr. Marc Lamont Hill makes his debut as host of the nationally syndicated television series Our World with Black Enterprise this weekend, October 9th and 10th. He brings a fresh and engaging perspective to a show uniquely focused on the contemporary African American experience. Airing in more than 145 markets, the weekly, 30-minute program is a mix of one-on-one All Access interviews with today's top newsmakers and celebrities, On the Record discussions about the hottest topics affecting African Americans, and Slice of Life profiles of some of the world's most intriguing people. A distinguished author, social commentator, and noted "hip-hop generation" intellectual, Marc Lamont Hill has emerged as a leading voice on the nation's most challenging issues. The Columbia University professor, who holds a Ph.D. with distinction from the University of Pennsylvania, has been lauded for his published work on topics such as hip-hop culture, politics, sexuality, education, and religion. As a regular contributor to the Fox News Channel, Hill demonstrated a willingness to engage in today's most heated debates and take on the toughest issues. As host of Our World with Black Enterprise, Hill continues to prove that no topic is off limits with a full season of shows that will engage viewers on subjects ranging from the controversial and serious to the entertaining and sensitive. "Marc brings an exciting new element and point of view to our show," said Black Enterprise President & CEO Earl "Butch" Graves Jr. "He combines the credentials of an academic with the understanding of a new generation of African Americans who came of age in the era of hip-hop, digital technology, and President Obama. His perspective as an educator, journalist, and an outspoken member of our community gives our audience the opportunity to experience a fearless take on the issues that most affect them." The season premiere of Our World with Black Enterprise features a one-on-one conversation with Grammy Award-winning entertainer and philanthropist John Legend and a hard-hitting roundtable on the shocking education gap for black youth in urban communities, who are falling behind at an alarming rate. Plus, we profile Chicago-based Kids Off The Block, Inc., a nonprofit organization committed to providing at-risk youth with positive alternatives to gangs, drugs, and violence. Our World with Black Enterprise airs in syndicated markets across the country, including New York, Chicago, Los Angeles, and Atlanta. Check local listings for time and station information. The broadcast can also be seen on cable's TV ONE Sundays at 6:00 a.m. (EST). Visit www.blackenterprise.com for more information about BLACK ENTERPRISE television broadcast and video. 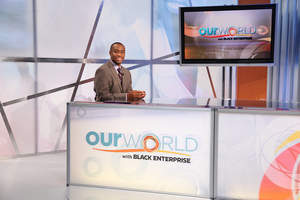 Our World with Black Enterprise is a weekly, half-hour television series that spotlights the contemporary African American experience. Hosted by author, activist, and academic Marc Lamont Hill and co-produced by Chicago-based Central City Productions, the nationally syndicated program features news, entertainment, roundtable discussions, and special interest stories about African Americans from all walks of life. The program debuted in September 2006. For digital press inquiries contact Patricia Césaire, Director, Digital PR & Marketing, at 646.841.4568 and cesairep@blackenterprise.com. For inquiries and interviews about BLACK ENTERPRISE contact Andrew Wadium, Director of Media Relations, at 212.886.9598 and wadiuma@blackenterprise.com.